An online friend recommended this a while ago and it works so well for our family. My kids used to constantly ask me “what can I eat?” and pester me for snacks between meals. Then I saw a post about leaving healthy snacks out on a platter for kids to visit any time they wanted. I grabbed a plastic 4-compartment party tray that had been headed out as a donation, and our munchie platter was born. I try to stock it with all healthy foods, things that I’d serve for meals. They’re often organic and are low in sugar and fat. I also try to offer a balance of veggies, fruits, protein and carbs. Lastly, I aim for a rainbow to get a good mix of nutrients– green, orange, red, brown, etc. I’m amazed at how smoothly our days go now that the munchie platter is part of our routine. The kids are easily getting in their recommended servings of veggies and fruits now, and it’s made life much easier for me. Update: Now that we have 4 kids munching, this has worked less and less well. Kids would gobble up one item and practically crush each other to get to the “good stuff” before the others ate it all. 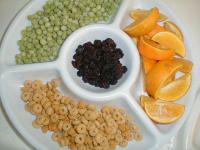 I find it much easier and more fair to just make up little snack plates a couple of times a day for each child. This entry was posted in cooking/home ec, nutrition by Alicia. Bookmark the permalink.